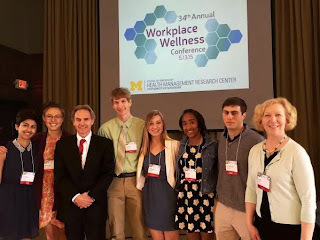 In a new partnership between SkyWell and the University of Michigan Health Management Research Center, 6 Skyline students were selected by the Health & Medicine Bio-Medical Science Magnet to represent SkyWell at the 34th Annual Wellness in the Workplace Conference. The conference was held on May 13, 2015 at the Michigan League in Ann Arbor. 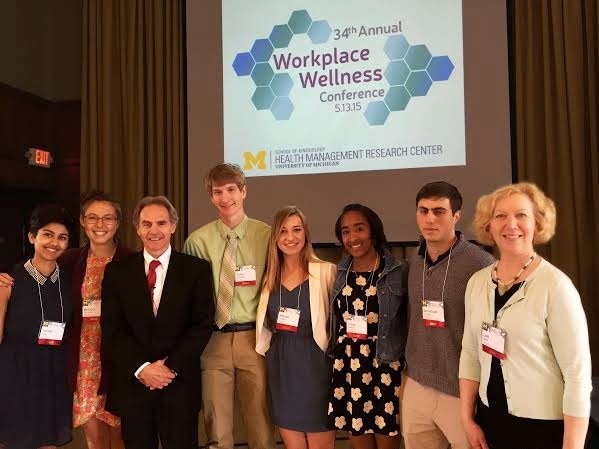 SkyWell interns were introduced by Dr. Michael O'Donnell, Director of HMRC and Clinical Professor in the School of Kinesiology. Class of 2016 Wellness Champions Collin Cannaert, Allison Schulcz, Janay Ramirez and Jonathan Gurkan. Photo courtesy of HMRC. May is National Physical Fitness Month, sponsored by the President’s Council on Fitness, Sports and Nutrition. Now that Spring is finally here, what better time to celebrate physical activity and bring awareness to how a physically active lifestyle can promote personal wellness. At Skyline High School, our SkyWell Wellness Champions have many creative ideas about the physical dimensions of wellness and how we can encourage our student body to get active. How about a Field Day with teams based on our SLCs? Why don’t we sponsor a walking/bike event between Skyline and Community High School? It’s only 3.7 miles and could be fun sharing our wellness message with another Ann Arbor school. Or perhaps a jump rope marathon, just like we did in elementary school, to raise funds for a wellness organization? This year marks the five year anniversary of First Lady Michelle Obama’s Lets Move Initiative. Let’s join her by bringing together students, parents and teachers at our school to promote moving more during the school day. Due to severe weather the SkyWell meeting has been rescheduled to Monday, May 18th. Come to the next SkyWell meeting on Monday, May 11th after school in Mr. Bradley's room. We will be discussing Psycho-Social wellness. The meeting will run from 2:30 to 3:15. Bring yourself and your friends! SkyWell water bottles will also be on sale.